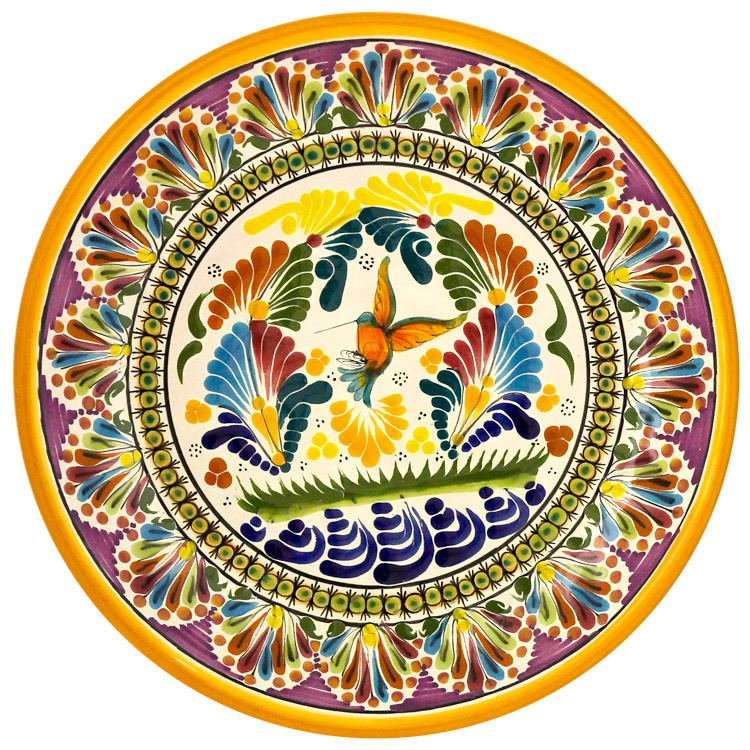 Talavera pottery is a unique art form produced in Puebla, Mexico. Although it has a long history, little is known concerning the aspects that contribute to perceptions of authenticity. A study of people who purchase Talavera found that authenticity encompasses five main factors: Appearance/Utility, Tradition and Certification, Difficult to Obtain, Locally Produced, and Low Cost. ANOVA indicates that there are differences with respect to the perception of authenticity with regard to appearance/utility and locally produced. Local tourists view authenticity through appearance and utility while international visitors are more concerned with the pottery being locally produced by local residents. 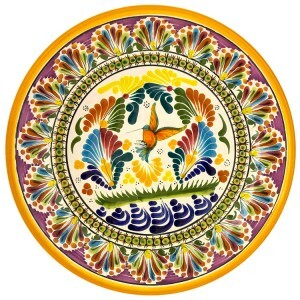 The challenge for the people of Puebla is to continue to encourage interest in Talavera production while attempting to maintain its perception of authenticity and uniqueness among local residents and visitors to the region. In the early 20th century, interest developed in collecting Talavera work. In 1904, an American by the name of Emily Johnston de Forrest discovered Talavera on a trip to Mexico. She became interested in collecting the works, so she consulted scholars, local collectors and dealers. Eventually, her collection became the base of what is currently exhibited in the Metropolitan Museum of Art in New York. Her enthusiasm was passed onto Edwin Atlee Barber, the curator of the Pennsylvania Museum of Art. He, too, spent time in Mexico and introduced Talavera into the Pennsylvania museum’s collection. He studied the major stylistic periods and how to distinguish the best examples, publishing a guide in 1908 which is still considered authoritative. The world of interior design knows Talavera pottery as an ornate style of ceramics produced solely in Mexico by proud local artisans. These vibrantly colored, handcrafted works of art have been fashioned in the same way for centuries and appreciated for their quality and aesthetics for just as long. 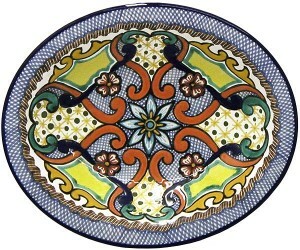 So what is it about Mexican Talavera that makes it so special? Hang plates instead of framed artwork on your walls! 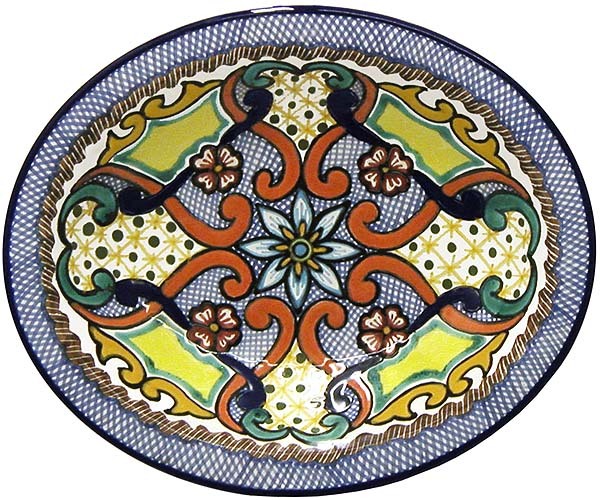 Talavera Plates are a great way to add color to an otherwise neutral room, so take yours out of the cupboard and try some of these great ways to display them. For collectible plates you don’t use, why not create “artistic impact” by grouping the plates in a large cluster for a jaw-dropping display. Another idea is to paint a wall in a complementary or contrasting color, hang wood shelves and fill your shelves with your decorative plates. How do you hang plates in an artistic way? “Grab some leftover newspaper and trace each plate or framed piece onto the paper and cut them out. Use your paper cutouts to figure out the proper layout of the series. Experiment with your grouping on the floor to work out the arrangement you like best. Gently tape the cutouts to the wall in the design of your choosing. Periodically step back to make sure you are happy with the spacing and the height of the entire group. Once you are completely satisfied with the placement on the wall, you can begin hanging the plates.” – Sheila Schmitz, Houzz Editor. 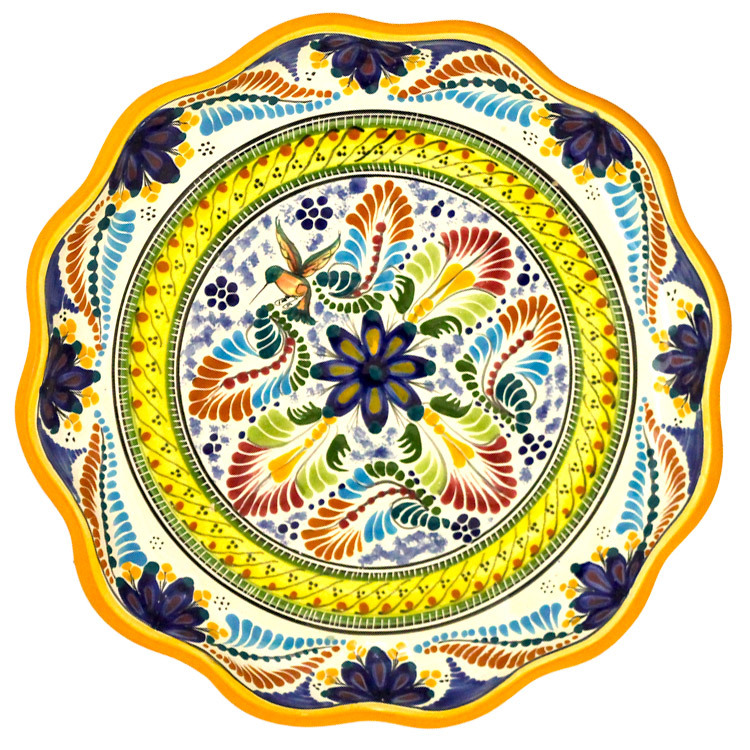 So whether for home decoration or for day-to-day use in the dining room, our extensive selection of authentic Talavera Pottery is sure to make a wonderful addition to your home décor. There’s nothing shy about Mexican interior design as it is full of color and ornate details. 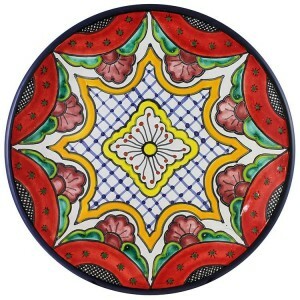 Instantly add an eye-catching colorful backdrop to your kitchen with our decorative Majolica Tile Murals. Each mural is the perfect finishing touch to any kitchen which is in search of a splash of color and Mexican flair. Both of our new mural designs offer artwork which evokes the vibrant spirit of Mexico. 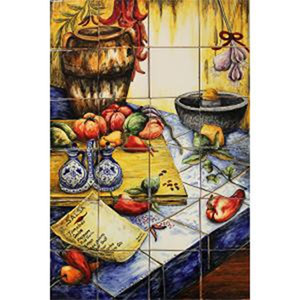 Our Chile Harvest Tile Mural and Fresh Salsa Tile Mural are highly-durable, washable and can go where prints and paintings can’t. Majolica pottery originated in the 16th century and is primarily distinguished by the milky-white glaze used after the first firing. Each mural is created in Santa Rosa workshop which lies in the mountains of central Mexico, high above the city of Guanajuato at 8,360 feet. Each Santa Rosa Majolica piece is in itself a unique work of art, one that will bring the flavor and flare of this artistry directly into your home. All majolica tile murals are perfect for kitchen application as they have a semi-gloss finish that is fade, weather and scratch resistant so they can be installed either indoors or out! Where will you install your new mural? Day of the Dead Majolica Kitchen Canisters – As bit of punch to your kitchen with our day of the dead majolica pottery canisters. Square shaped and design with soup smooth rounded edges, these are the perfect pieces to generate a bit of conversation in the kitchen. Majolica dates back to the 16th century and is distinguished primarily by the milky white glaze that is used after each piece is fired the first time. 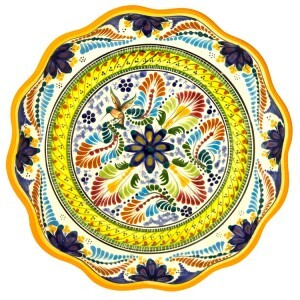 Very diverse, and similar to Talavera, the main distinction is that majolica offers a much wider range of colors, and the style is much less restrictive. These canisters are produced in our Santa Rosa workshop, nestled in central Mexico, high in the mountains. Originally started by a family known as the Salazars, majolica has been crafted in Santa Rosa ever since for the past 45 years. Paying close attention to the tradition and methods used by the founders, the grandchildren manage every aspect to include studio design, sourcing, glazing, and even the creation of new design styles. As such, each piece is unique and has a bit of charm and character unlike anything else you have ever seen. These day of the dead canisters are certainly no exception. The whimsy, and playful design are a great way to give a head nod to one of the oldest of Mexican traditions. Honoring the dead has been a mainstay in Mexico for centuries, and these pieces speak to that culture. They are also quite utilitarian! Store your sugar, flour, rice, corn meal, and other kitchen staples inside to keep them safe, and close at hand for quick use. Easy to clean, simply wipe the canisters with a damp towel and the original luster is restored. Playful, colorful, and vibrant, these canisters are the perfect way to punch up a dim kitchen. 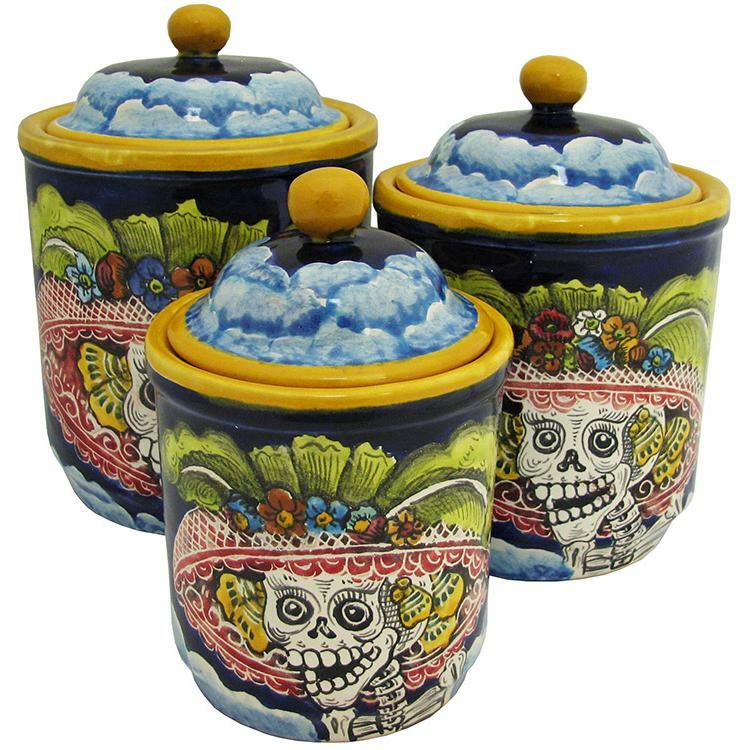 Add a bit of fun and frolic to your kitchen counter tops when you order our majolica pottery day of the dead kitchen canisters. Sizes range individually from small to large, or purchase all three as a set and save a few extra dollars. These are fun pieces that you don’t want to be without. Talavera Ginger Jar Vases – Looking for a truly unique accessory for your home? Well, our Talavera ginger jar will have no problem fitting the bill. 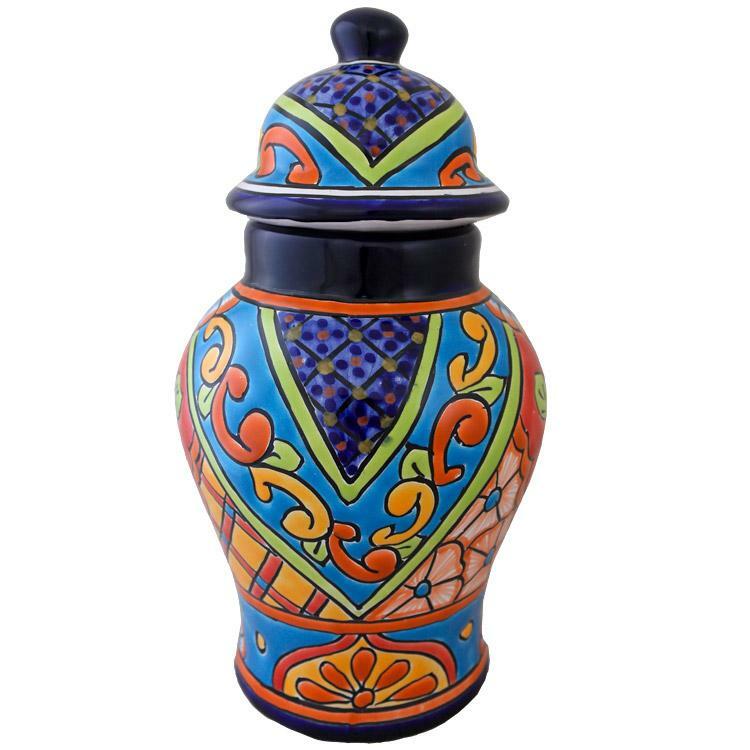 Handcrafted from Clay, and then painted in a classic Talavera style, this vase is simply beautiful. The artisans around Dolores Hildago, Mexico certainly know what they are doing. This ginger jar amazing hues of blue, contrasted with soft yellows and light greens. The dominant orange color works to hold the artistic floral pattern together, grounding it as well. The elegant siren shape gives just a touch of class that you want for your home. This vase would look beautiful displayed anywhere. Design and Placement Ideas – Group this vase together with a couple of pictures, or some other knickknacks on top of a console table to create interest in depth. Use it as a focal piece by placing it on your mantle, or in your guest room on a dresser. 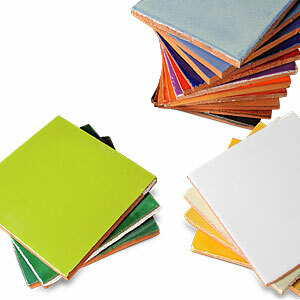 You could even take a color from the piece and use it to design an entire room. Simply pick out the colors on the face and use them for Accent pillows on your sofa, drapes for your windows, and other pieces of art to hang on the walls. Sometimes it is amazing how one piece can inspire an entire room. Yet, that is often the case with accessories purchased from La Fuente Imports. The handmade quality and colorful design’s inspire people to create entire things around one or two pieces that they purchase from us. This ginger jar vase is no different. Purchase one today, and put it to work for you. Purchase a couple and use them to create symmetry on a foyer table, or add a sense of balance to a large mantle. Group three or more for a collective art piece. With an accessory that has this much class and style, you simply can’t have too many!